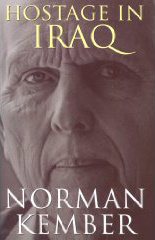 Written with honesty and emotion, Norman Kember describes in detail his four month ordeal, during which he was imprisoned in a small room and chained to the two Canadian peace activists, James Loney and Harmeet Singh Sooden, and the American Tom Fox, who was later killed by his captors. Kember experiences fear, loneliness, boredom, and at one point, contemplated suicide. Yet his wry sense of humour never quite deserts him. Move, gripping, and surprising, ‘Hostage in Iraq’ is a testament to the enduring power of the human spirit, and is set to be a huge success this spring. Includes illustrations and drawings from Kember’s captivity journal. Available from The Quaker Bookshop, Friends House, 173 Euston Road, London, NW1 2BJ (bookshop@quaker.org.uk; 020 7663 1030). Network of Christian Peace Organisations urge UK participation in UN Nuclear Weapon Ban negotiations.